Nice ping and not a bad speed. Now all I need is to find some time to unpack the rest of my boxes and connect my Xbox so I can get some gaming in! What are your speeds these days? Share em here! 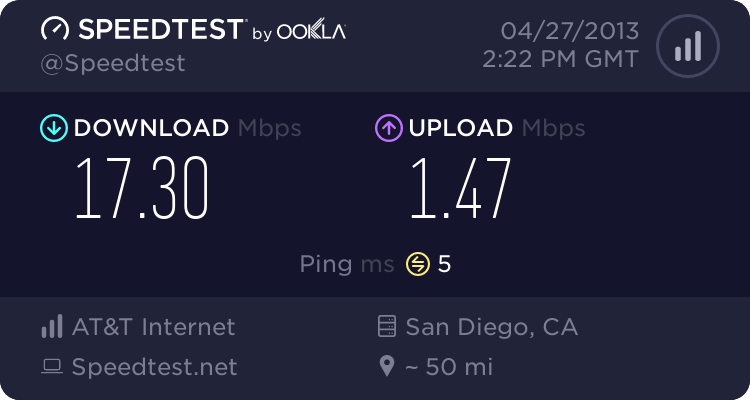 If you need to test them, go to Speedtest.net. Wow, I just noticed the Grade is C+. Man, what do we need to get more than barely above average?! Sam, Geoff, Jordan, Brick and Sabrina talk about State of Decay, improved device support for SmartGlass and the week in movies, television and games. Geoff, Jordan and Brick bring you a new edition of The Top 5 List. This week, they talk horror movies, news and the week in entertainment! Visit the Facebook page and list your own Top 5 Horror movies! The music in the audio program is “Stir it Up” by Bob Marley. Geoff, Jordan and Brick talk about and spoil The Walking Dead finale, as well as the season opener for Game of Thrones and a few new shows that have popped up on the tellie. Geoff’s microphone gets turned back on at about two and a half minutes in. Jordan is a jerk. Thank you. The music in the audio program is Nena’s cover of “Fade Into You” by Mazzy Star.